These days, there are so many great rides to choose from. How do you pick? 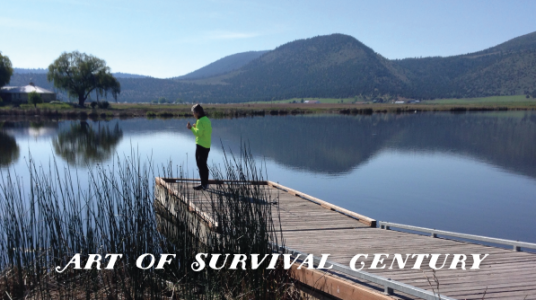 The Art of Survival Century on May 26+27 is a ride that ticks all the right boxes. So just what makes this ride so special? For one, it’s tucked away. We mean really tucked away. Located outside of Klamath Falls on the border of Oregon and California, the ride is a hidden gem. You’ll go miles without seeing a car, and when they do come by they give cyclists a wide berth. We asked one of the rest stop volunteers about this last year and he said that’s nothing special, “That’s just how the drivers are here.” Out in the country. Where people are nice. We ride this event every year and can’t say enough good things about it. Rest stops feature homemade granola bars, the volunteers are outstanding, the routes are serene and the birdlife is extraordinary. The region is wildlife refuge and bird sanctuary. Driving there in the early evening prior to the ride, a sea of birds dove all around our car along a four mile stretch we had all to ourselves – and the birds. We camped on site at the fairgounds, and were treated to a restful sleep, hot showers and few other campers. Best of all there was no charge and we were just steps from the start line. This is one of those rides you simply can’t forget. Make a weekend of it, take the time to get there, and plan to explore after the ride. The Art of Survival Century was named the Fifth Best Bike Ride in Oregon in ORbike’s riders’ poll and it’s no wonder why. New this year, there is an optional gravel ride on day two!